The Brothers Bloom is a witty comedy drama that involves two brothers who spent their lives growing up in foster homes around the country. Unfortunately this harsh life hasn’t been too kind for them and now they are grown conmen who create elaborate scams for money. 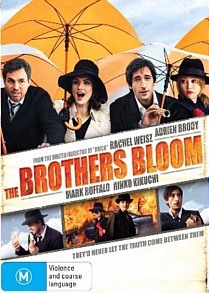 Stephen (Mark Ruffalo), the older brother is the brains behind the duo, whereas Bloom (Adrien Brody) is more the innocent face of their scams. However, their life soon changes when they pull off one of their more elaborate scams in Berlin, but Bloom has had enough. Bloom wishes to lead a normal life and at the tender age of 35, he wants to move on and with that, they part their ways forever... Fast forwarded three months later and we find Bloom, an alcoholic and unable to find the success that he dreamt of which is when Stephen walks into his life again, offering him one more chance to make it big. Although slightly reminiscent of Dirty Rotten Scoundrels but more "European" in style, the brothers target a lonely and eccentric heiress by the name of Penelope Stamp (Rachel Weisz). As they begin their tangled web of lies, it seems that Penelope is not as innocent as they first thought, especially when she tells them that the trick to not feeling cheated is to learn how to cheat. Then the conflict begins and it seems that the scammers have indeed been scammed. The drama flows smoothly through the movies but at times the comedy falls flat but the star of the movie is Weisz who plays a wonderful shy and innocent heiress but in actual fact, she is much more and manages to capture this uniqueness of the character perfectly. Ruffalo plays his usual characters, although with more humour and Brody hams it up in certain scenes to steal the show and give the audience the laughs they need. The video quality is actually showcased in the movie, thanks to the great cinematography and wonderful backdrops where it is filmed. Add in a quirky musical score and one can almost believe that is a true European film but in actual fact, it's all smoke and mirrors. In conclusion, director Rian Johnson creates an interesting movie by linking a variety of timelines together that at times, it seems like the Brothers Bloom are gangsters from the 30’s but in actual fact, the movie is set in modern times. It’s an interesting mix that works at times and fails at others because some of the plots become a little too unrealistic. Rent before you buy.